Little, Brown Books for Young Readers, 9780316258500, 96pp. The Levines are finally getting a pet--a furry one that is. They are excited about adopting a kitty they name Jelly, but they don't get very far in the process when Ben starts sneezing. Oh no, he's allergic! Lola is devastated and sets out to find Jelly a good home. Luckily, Lola is rewarded with a very happy (and still furry) ending! Monica Brown, Ph.D. is the author of many award winning books for children, including Waiting for the Biblioburro and Marisol McDonald Doesn't Match/ Marisol McDonald no combina. Her books have received starred reviews, Pura Belpre honors, an NCTE Orbis Pictus honor, Americas Awards, and a Christopher Award. Monica's books are inspired by her Peruvian and Jewish heritage and her desire to bring diverse stories to children. Monica is a professor of English at Northern Arizona University, where she teaches multicultural literature. She lives in Arizona with her husband and two daughters, and she invites you to visit her website at lolalevine.net. * "Brown introduces a smart, young protagonist with a multicultural background in this series opener for chapter-book readers. Celebrate a truly accepting multicultural character." 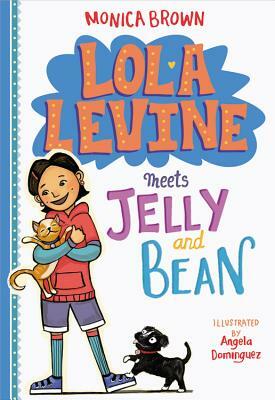 "Lola's personality shines through here, with a vibrant first-person narration that matches her energetic spirit." "[A] great book for the beginning chapter book reader."